“Wide Awake in America” was an EP designed for the American market, and first released in North America on May 20, 1985. It was initially released in the US on that date in 12-inch vinyl and cassette. It was also released in Canada, but only through the Columbia House record club, where it was issued on cassette. Later the EP was released in Japan on cassette and 12-inch (on September 1, 1985) and in Brazil on 12-inch (in 1986). The EP was also made available on eight-track cassette through the RCA Record Club in the US and Canada. The title of the EP is taken from the “I’m wide awake, I’m not sleeping” lyrics from the song “Bad”. It is titled “In America” even though both of the “live” tracks were recorded in Europe. The EP was meant as a replacement for “The Unforgettable Fire” single that had been issued in most countries around the world a month earlier, on April 22, 1985. That single had featured three of the four songs found on “Wide Awake in America”. Only “Bad (Live)” was a new track for the release of “Wide Awake in America”. The EP did feature new artwork that differed from that used on “The Unforgettable Fire”, and the EP was also kept in print over the years, once again differentiating it from the singles being released at that time. There are four songs on the “Wide Awake in America” EP. “The Three Sunrises” and “Love Comes Tumbling” were both studio tracks left over from the Slane Castle sessions U2 had held with Brian Eno and Danny Lanois. On the original 7-inch recording of “The Unforgettable Fire”, the version of “Love Comes Tumbling” had a false start, and then once the song started, there were approximately 32 beats before the vocals started. The version of “Love Comes Tumbling” used here on “Wide Awake in America” does have the 32 beats before the vocals start, but it edits out the false start, otherwise the two appear to be the same. Later, when “The Unforgettable Fire” was issued on CD, the version used was the same as the version on the “Wide Awake in America” EP. The two live songs included “Bad” recorded at a performance at the NEC in Birmingham UK on November 12, 1984 and produced by Ron Saint Germaine, U2 and Kevin Killen. The second live track wasn’t live at all, but was rather recorded in a closed soundcheck at Wembley Arena in London UK on November 15, 1984. The crowd noise was added by producer Tony Visconti in the studio during post-production work at Good Earth Studios. A new video for the song “Bad” was readied and sent to music video outlets. The video consisted of footage filmed during the European tour in 1984, and the audio of the video, is the live audio from the EP. The video was directed by Barry Devlin and produced by James Morris, and was filmed in October – November 1984 during shows in Paris, Brussels, Rotterdam, London and Glasgow. Sales of the EP were strong, and it even entered the UK charts on the strength of import sales in the UK. There was such demand for the EP, that in 1987 while reading a CD release for the countries the EP was already available in, the record label also issued a domestic release in the UK on October 19, 1987. Later in 1989, as part of the Island Masters program of re-releases the CD was also released in a number of additional countries including Argentina, France, Germany, Italy, as well as re-releases in the UK and Japan. A later release in 1997 took the release from the USA, packaged it in a unique slip case, and released the CD in Mexico as well. The cover image is of Bono live in concert, in black and white. Photographs and design were by Matt Mahurin. The back of the EP featured images of all four band members in black and white, partially obscured in shadow. Mahurin is an American illustrator, photographer and director. He was not only involved in “Wide Awake in America” but also co-directed the video “With or Without You” in 1987 and directed the video of “Love is Blindness” for U2 in 1993. In 2010, as a special release during Record Store Day’s Black Friday event, U2 released an EP called “Wide Awake in Europe”. The EP contained three live performances all from appearances in Europe, and again the release was for the American market. 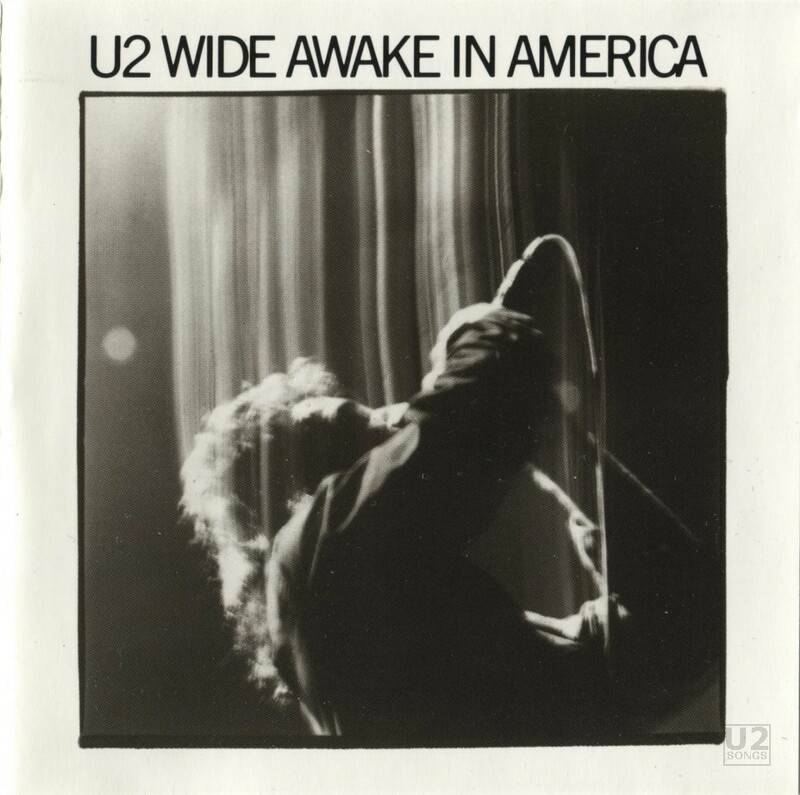 The design of the EP was done by Shaughn McGrath, but was based on Mahurin’s design for “Wide Awake in America”, and the cover once again featured Bono in concert, with four photographs on the back featuring each of the band members in highly contrasting images. Produced by U2. Mixed by Ron St. Germain. Produced by U2 / Brian Eno / Daniel Lanois. Mixed by U2 / Kevin Moloney. Produced by Tony Visconti. Location Engineer: Kevin Killen. Recorded live at Wembley and Good Earth Studios. Produced by U2. Engineered by Paul Thomas. Mixed by U2 / Kevin Moloney. UK, Official Charts: #11 (August 31, 1985) as an import.